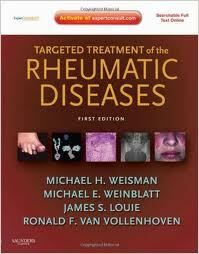 Targeted Treatment of the Rheumatic Diseases: Expert Consult - Online and Print [Hardcover] - Michael H. Weisman MD (Author), Michael E. Weinblatt MD (Author), James S. Louie MD (Author), Ronald Van Vollenhoven (Author). Targeted Treatment of the Rheumatic Diseases takes a patient management approach to treating adult and pediatric patients with rheumatic diseases. Michael H. Weisman, Michael Weinblatt, James S Louie, and Ronald Van Vollenhoven offer their unique insights into choosing the correct pharmacological and non-pharmacological therapies for your patients. Chapters cover the full breadth of rheumatic diseases, rheumatoid arthritis, lupus, connective tissue diseases, osteoporosis, regional pain disorders, and fibromyalgia. The full-color design presents detailed clinical photographs and treatment algorithms for visual guidance and easy reference. You'll have all you need to provide your patients with the most effective treatment from this unique resource?also available online at expertconsult.com. Includes access to the fully searchable text online at expertconsult.com, along with MedLine linked references. Focuses on patient management instead of disease management so that you can tailor treatment plans according to each patient’s needs.